So… what do we know about B&Q? Set up (according to Harry Hill) by “Lynda Baron and Pauline Quirke – from the feather programme”. Sinéad O’Connor is obviously a fan. I went to B&Q last week to get some trellis for an older relative of mine. It was made from quarter inch thick wood stuck together with staples. Much of it was coming apart. A 6′ x 3′ piece as £16.98. She needed 12′ x 6′, which would have cost just short of £68. I decided to look elsewhere. I went to a local timber yard and bought enough wood (38mmx19mm, tannelised) to make the trellis, as well as more than enough screws to stick it together for £27. OK, so I had to make it myself, which took a few hours, but it will last for many years, whereas the B&Q stuff probably won’t last a summer. I bought three posts too. £12.98 each at B&Q, £5.25 each at the yard. What do I know about B&Q? Don’t go there. I can’t be the only one who can guess what Neil G wanted to trellis. There was a touring car driver in the 90s who changed his name to John B&Q by deed poll to get his sponsor’s name mentioned that few more times per race. The one thing I can find in B&Q without fail (and am happy to assist others to locate) is the sign that says [EXIT]. 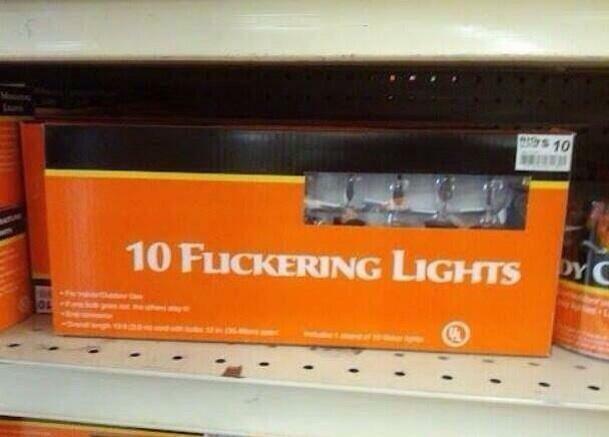 Of course there is some room for improvement at B&Q – maybe a revisit to packaging designers? Within six comments I have learnt an entirely new word – kerning – and that another one (used correctly by the Campesinos fella) doesn’t mean what I’ve thought it did for at least 40 years. B&Q are better than any tool hire shop. Spent a dusty weekend sanding a badly plastered upstairs bedroom with a newly purchased JCB power sander. Easily exceeded its average useful life. In the last half hour before smooth wall perfection, a plastic dust box lug snapped so I limped home with a dust mask then took the only slightly broken and very abused sander back to the shop. “Would you like to exchange it or a full refund?” The well made up but obviously bored customer services lady asked in monotone. Almost in disbelief and distracted by the dust cloud still emanating from the forlorn sander recently set down on the counter, I pondered a moment and blurted “full refund please”. With a quibble-free credit in my planned overdraft, she didn’t see me for dust. Dale Hire, your tools are older than B&Q’s. I for one will be back again.